Companies in the Weifang Hi-tech Industrial Development Zone are looking for international partners in order to strengthen their long-term development, and officials and business leaders there said they were making good progress. Chinese equipment manufacturer Weichai Group, headquartered in the zone and currently in a key phase of its business upgrade and transformation, hosted the first suppliers gathering there since it was established, aiming to deepening cooperation with companies overseas. More than 220 representatives from more than 100 companies participated in the meeting on Feb 26. 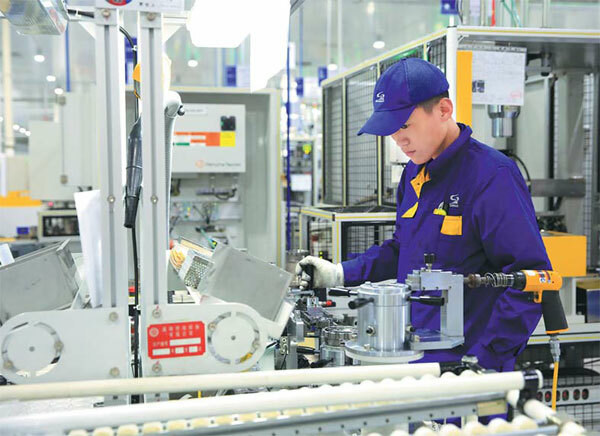 Officials said that Weichai Group in recent years has taken on great responsibilities in supporting Shandong's efforts to replace old economic development drivers with new ones. The company has announced an ambitious plan to achieve annual sales revenue of more than $100 billion in the upcoming years, compared with sales of about 220 billion yuan ($34.4 billion) last year. For both Weichai and its suppliers, that kind of exponential growth means tremendous business opportunities will spring up. In line with that, Weichai is building an industrial park in the zone to support its production and upgrade. Global vehicle parts suppliers and service providers are encouraged to set up production facilities in the park. Meanwhile, Weichai's German supplier, Mann+Hummel has decided to utilize its know-how to enhance the speed of its responses to Weichai's requests and apply better controls on its costs to support Weichai's development plan. Strategic cooperation is considered a key factor for companies in the Weifang Hi-tech Industrial Development Zone to achieve better growth. Apart from Weichai, automotive manufacturer Foton and some local manufacturing giants have also partnered with international companies to boost their core competitiveness. The local giants include GoerTek, an audio equipment developer, Shengrui Transmission, the developer of the world's first front-engine, front-drive eight-gear auto transmission, and Weifang Special Steel. Shengrui Transmission won the National Science and Technology Progress Award in January last year. The award is one of the top prizes devised by the State Council in recognition of scientific contributions made by both companies and individuals. It is the first time a vehicle component maker in China has won such an award. Since its establishment, the company has been committed to integrating its overseas resources to support its growth. Shengrui has established research and development centers in Germany and the United Kingdom to support its new product development. Shengrui claims its products have leading German design, UK engineering technologies and China's industrial production technologies. Shengrui also claims intellectual property rights for products developed through partnerships with German companies. "We required our partners to disclose the complete development process. Our engineers stayed in foreign countries for three years," said Zhang Guanghan, deputy director of Shengrui's Engineering and Technology Research Institute. Zhang was assigned to work in leading companies and labs in Germany and Italy, to learn about their technologies and methods in dealing with matters over the years. Shengrui has built an industrial park and invited some leading transmission component makers to launch operations there. The park is now home to nine companies, including two listed companies and one State-owned enterprise. The zone has long been committed to encouraging leading companies, such as Weichai and GoerTek to strengthen communications with famous universities and institutes to expand local R&D capacity. The zone has set out a goal to have 50 famous universities, institutes and other campuses set up representative offices there by 2020. And it is estimated that the output value of its high-tech industry by 2020 will account for 80 percent of overall output value of the zone. Officials said they aim to have two companies established there with annual sales revenue of more than 100 billion yuan by 2020. Zhou Jinjiang contributed to this story.